I’m back in my chair relaxing by the fire. I’m recovering from a whirlwind couple days in the Kalamazoo, Michigan where we got together to celebrate the 15th anniversary of IN THE WOODS. This creature feature was released in a dozen countries and has grown into a true “cult classic”. I got a chance to see some of my old co-stars and our director, his wife and family. The night before we looked through all the concept art, posters and promo stuff. We looked at all the past business it has done and toasted a NEW distribution deal. The deal is for Blu-Ray release and VOD into the UK and other Europe nations to begin with. Friday was a radio show followed by a TV show and of course the nights screening. It was great to just enjoy what the film is and the life it has grown into. What it has grown into is a film that has audiences cheering, toasting and enjoying every bit of cheesy dialogue and clumsy monster. I’m very happy that the film hasn’t just disappeared but has grown in popularity. Next up Oct 23 “Locked in a Room” will be playing at the Canton library in Michigan. We are also gearing up for 17th East Lansing Film Festival with ASHES OF EDEN. We are going to be making an announcement about this films distribution at the festival. BESTSELLER and THE TERRORIST are continuing in their post production work. Some exciting stuff is starting to develop also on the new film front. I announced recently my involvement in WASTELAND, Tales of the Desert. We announced our main cast of Nick X. Parson who will join David Gries and I in Nevada this December. There will be some cool developments on this project we will be releasing soon including some 1st teaser art and social media sites. We look like we might be closing in on a deal with DONORS, another thriller. I’m going to keep this update short as I didn’t get much sleep the last two days. Also MSU is getting ready to play in just a few and so I’m going to take a mental break for a few hours here. I think some good food is in order. I want to once again thank all my fans out there. 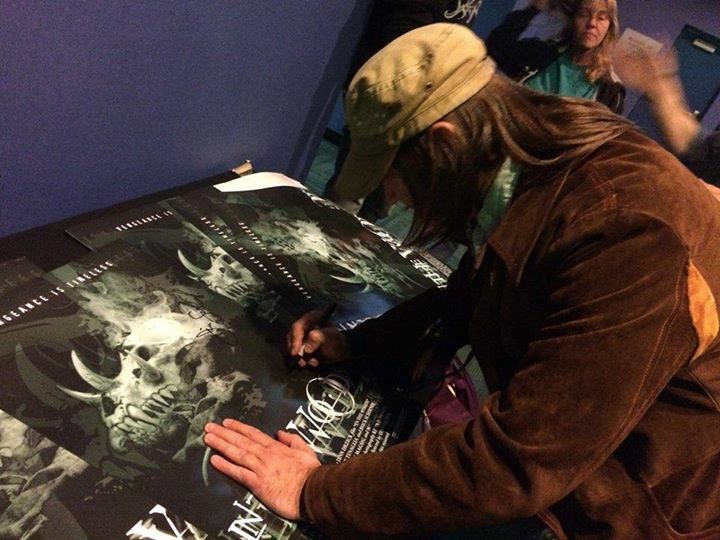 It was a pleasure to meet some of you last night and sign some posters.